The German selection Unser Lied für Lissabon was held tonight with six songs competing for the ticket to Eurovision Song Contest 2018. 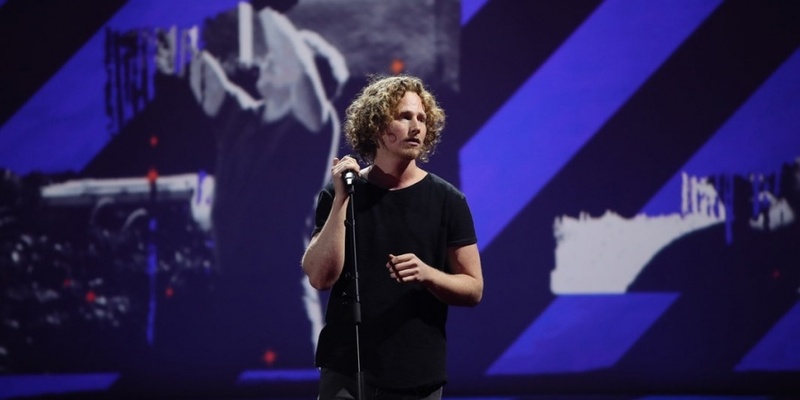 Michael Schulte won with the song "You Let Me Walk Alone"
The best of tonight's six songs in Unser Lied für Lissabon is You Let Me Walk Alone by Michael Schulte. This was decided by a mix of public voting, a one-hundred-member Eurovision panel, and an international expert jury panel in tonight's German selection for Eurovision Song Contest 2018, live from Berlin. Germany 2018: Michael Schulte - "You Let Me Walk Alone"
You Let Me Walk Alone is written by Michael Schulte himself, along with Thomas Stengaard (Only Teardrops), Nisse Ingwersen and Nina Müller. The six artists were unveiled in December 2017, and their songs were released this week. The artists have been on a three-day songwriting camp together with fifteen national and international songwriters, composers and producers to create the six songs. Related storyGermany: S!sters to Eurovision 2019 with "Sister"
Michael Schulte, 27, is a German singer-songwriter from Dollerup in the northern part of Germany. He is known for competing in the talent show The Voice of Germany in 2012, where he reached third place. He also released his most succesfull album Wide Awake in 2012. Michael's career began in 2008 in front of a webcam and a microphone in his home, recording cover songs and uploaded them on YouTube. His YouTube channel now has 50 million video views! He has a very broad musical taste, and sings both songs by Rihanna, Jeff Buckley, Chris Brown, Coldplay and Eric Clapton. The Eurovision panel consisted of 100 Eurovision fans recruited through surveys on social media in order to reflect the taste of the wider European audience, and it participates in the decision-making process from the candidate selection phase to the televised final. The International Jury had 19 members who previously have been part of national juries of their respective countries at Eurovision. Germany 2017: Levina - "Perfect Life"
Germany is a grand old country in the Eurovision Song Contest. They have participated 61 times since the beginning of ESC in 1956. The only year Germany didn't participate was in 1996. Prior to the competition in 1996, 30 countries had signed up for participation, so EBU had to make a selection. Judges from the countries made a secret voting, where the 22 best qualified. During this voting, the judges only listen to but didn't watch the contestants. This turned out to be highly unpopular, and it was also the only time this method was used. The result of the voting was that Germany was ruled out. This was the first and only time Germany didn't participate in Eurovision Song Contest. Best result is two victories in 1982 (Nicole - "Ein Bißchen Frieden") and 2010 (Lena - "Satellite"), and the worst is seven last places. They are also a member of "Club Nul Points", with nul points in 1964, 1965 and 2015.